On this site you will learn how to do crunches, and you will also learn many different ways to do crunches to work your stomach, upper abs, lower abs, obliques, and love handles. Crunches are the most popular ab exercise, and there are many different ways you can perform crunches. You can do regular crunches on the floor or regular crunches on a stability ball or bosu ball. You can focus more on the obliques and the sides of your waist by doing various types of oblique crunches or side crunches. And, you can add a little extra emphasis to the lower abs by doing different types of reverse crunches. Bicycle Crunches on the Floor One of my favorite ab exercises! The pages above will teach you how to do crunches using many different tools. If you don't have fancy exercise equipment, don't worry about it. You can do different types crunches on the floor. 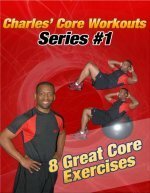 I am a huge fan of the stability ball and the bosu ball, so after you master crunches on the floor, learn how to do crunches on a stability ball. Because the stability ball and bosu ball are contoured they increase your range of motion which increases the muscle work. Also, because the balls are unstable, your ab muscles will work harder to maintain your stability. Choose your favorite types of crunches and make up your own ab workouts, or try one of the free ab workouts on this site. Or visit the picture directory of abdominal exercises to see all the ab exercises on this site.